How to make SSMS beep when a query is done? The other day I’m sitting at my computer, and this comes across Twitter. Well the good news is that there’s no need to develop anything. SQL Server Management Studio can already do this for you. Simply open SSMS, then click on Tools > Options. 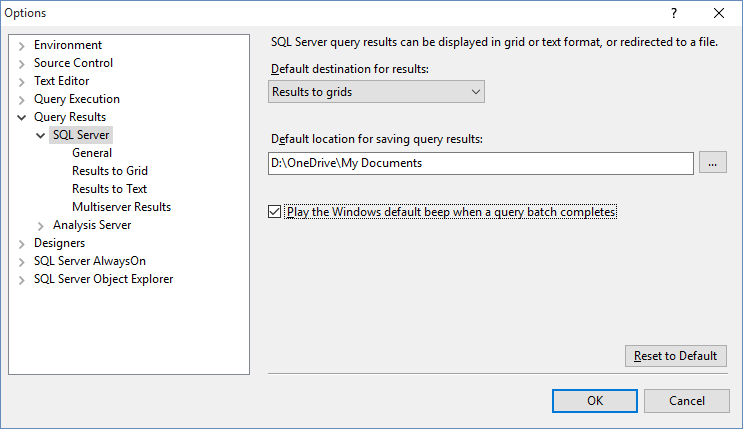 In the Options window open Query Results > SQL Server and check the check box next to “Play the Windows default been when a query batch completes” and click OK.
Don’t forget to turn up the volume when leaving and turn it back down when you are done. If you were wondering how long this feature has been in SSMS, I was first using it in Enterprise Manager, in SQL 2000. Good post. BUT WE STILL NEED THE TOGGLE SHORTCUT! So I'm holding out hope for someone to develop that. Sadly I don't see any way to do that by just using SSMS. You might be able to get it added to SSMS tool pack.